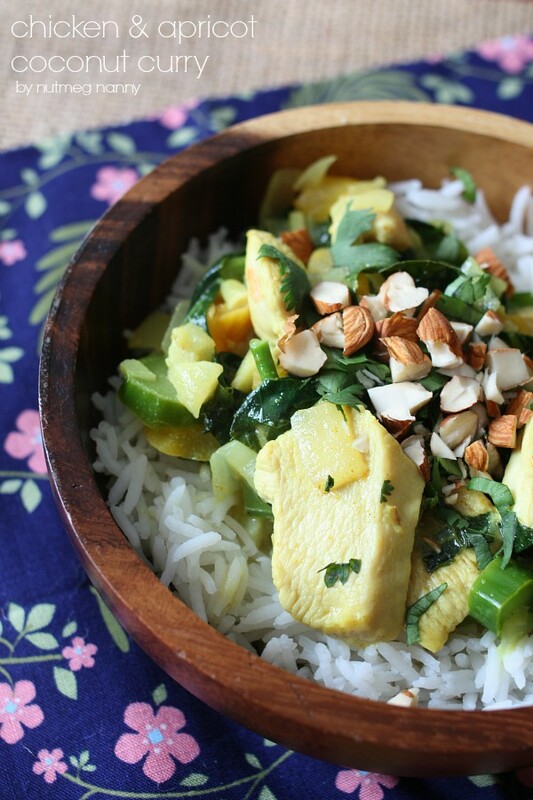 This chicken apricot coconut curry is packed full of flavor. 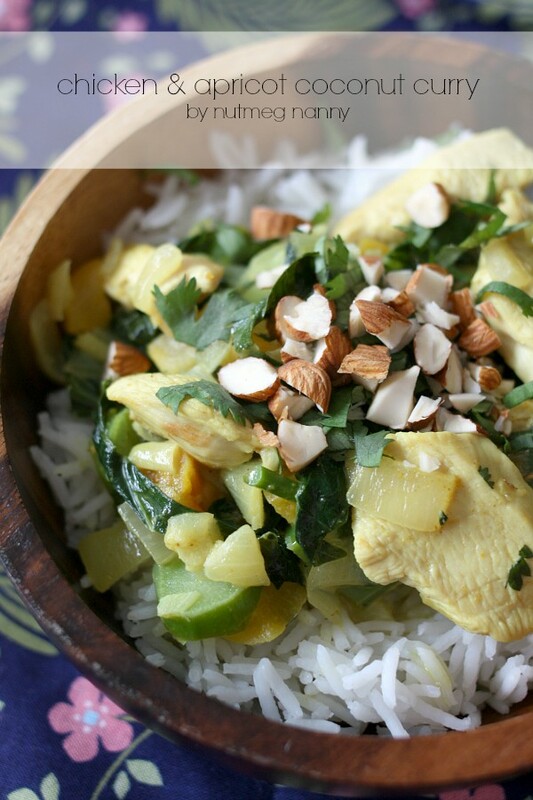 The sauce is lightly flavored with curry powder, coconut milk and topped with toasted almonds. I know that I run a food blog but sometimes I don’t want to cook. I spend my whole day cooking for SheKnows articles and then all of a sudden it’s 6pm and I haven’t even thought about dinner. Ugh. That’s when Blue Apron entered my life and things started to get a whole lot easier! They send you a box (meat or vegetarian) once a week that includes three delicious recipes and EVERYTHING you need to make them. The meat, the vegetables, the fresh herbs…everything. In my box I received Pork Souvlaki Pitas with Tahini-Yogurt Sauce, Bronzed Salmon with Orange Marmalade & Israeli Couscous and Chicken & Apricot Coconut Currry with Basmati Rice. While they were all delicious I feel head over heels in love the curry. It was super simple to throw together and the leftovers were perfect for lunch. Perfectly cooked chicken, creamy coconut milk, curry powder and tons of spices…what’s not to love? Looking for more delicious dinner ideas? Try my spicy garlic pork stir fry, healthier general tso’s chicken, spicy pork noodle bowl, 20 minute healthier orange chicken, spicy cashew chicken, tom kha gai, spicy coconut milk clams, easy beef and vegetable stir fry or my spicy beef with peanuts. In a medium pot add rice and 1-1/4 cups water and a big pinch of salt. Heat till boiling, cover, reduce heat to low and simmer for about 20 minutes, or until the water is absorbed and the rice is cooked through. Fluff the fully cooked rice with a fork. While the rice cooks, start cooking your curry. 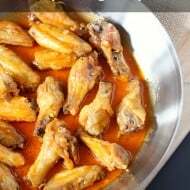 Add a large saucepan over medium heat and add 2 tablespoons olive oil. When the oil is hot add the onion and cook 2 minutes until soft but not browned. Add apricots and chicken and cook 3 minutes. Add in grated ginger and onion and cook for 30 seconds until fragrant. Add in coconut milk and curry powder. Cook for 3 minutes over medium heat, reduce heat and simmer on low for 5 minutes. Add in chopped Chinese broccoli (or bok choy) and cook 2-4 minutes until the greens are tender-crisp. At this point I like to dump in the rice and stir to combine. 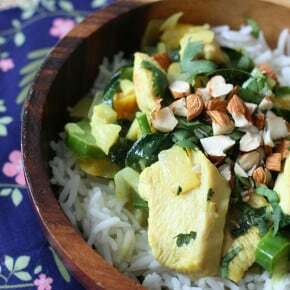 If you prefer to top your rice simple dived the rice between 3-4 bowls, top with curry mixture and garnish with chopped almonds and cilantro. Great recipe! I will try it out this week, too bad I can’t enter the giveaway. 🙁 The best ones are always US only. Booohooo. I LOVE chicken curry. As a matter of fact, the first meal my husband had with my family was a dish we call Curry Chicken Almondine (Stephie blogged about it on our anniversary). I truly believe she fixed it with the hopes that he wouldn’t like something different, but she didn’t count on me choosing a man that will try anything, and likes most things. Yep, he was hooked! This looks so good. That dish sound delicious! I’m such a sucker for curry. Mmm, looks and sounds so good. I don’t make curry dishes enough, but when I do we always like it. Need to make this one! looks tasty and nice business idea how affordable is it for folks though? It’s definitely more a luxury but I think it’s great for people who want to cook and don’t know where to start. It’s nice because it’s all mapped out for you and all the ingredients are provided. 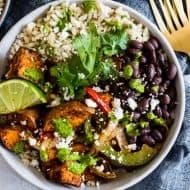 I love that more and more meal delivery companies are starting up! Must try this new service! I agree with you even though I’m a food blogger I like to have nights where i don’t have to “think”! The apricots, the coconut, the basmati rice, the herbs….all these wonderful flavors in one dish! Lovely! Whoa! Super cool! These all sound like meals I would LOVE to eat…especially if they involve minimal effort! 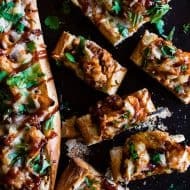 This looks delicious and I love this idea of a recipe in a box! I LOVE coconut curries! What a nice twist with the apricots! Totally delicious! Finally made this for dinner tonight. It’s good. I just broccoli and lite coconut milk. I think it’s a little curry-spicy, but my husband doesn’t think so at all. Good.